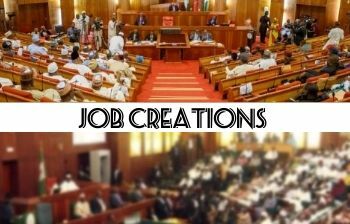 A Facebook user known as Bello Lukman analyse how 70,400 graduates can be employed by reducing Senators and Reps salaries. A Senator in Nigeria earns 36 million naira monthly, if this is divided into two, He gets 18 million. The balance of 18 million can be used to employ 200 Nigerians who will earn 90,000 naira monthly. This means on each Senator, we can employ two hundred graduates. Multiply 200 by 109 Senators, you get 21,800 graduate employees. The salary of a House of Representatives member is 25 million per month, half of this is 12.5 million, this amount can employ 135 Nigerians who will be paid 92,500 monthly. Multiply135 by 360 members you get 48,600 .From the two Legislative House, we shall create 70,400 jobs. l hereby move the motion for the reduction by half of the salaries of National Assembly members to create jobs for the youths. Those in favor say Aye!! Those against say Na.